The original hoof conditioner! Our proven, fast-acting conditioner was formulated using an age-old farrier recipe and is made with only the safest, most natural ingredients. Sound Hoof Conditioner ensures the overall health of your horse by protecting its hooves from wet and dry conditions, preventing dry coronary bands and hoof cracks, while maintaining moisture and ensuring a supple, healthy hoof. Directions: Apply Sound Hoof Conditioner liberally with applicator brush to the hoof wall, coronary band and hoof sole prior to RIDING, BATHING and STALLING your horse and just before entering show ring. Use Sound Hoof Conditioner daily to ensure healthy hooves for your horse. Store at room temperature. Ingredients Essential fatty acids, retinol (palmitic acid, a form of Vitamin A), triglycerides, natural antioxidants, gamma-linoleic acid, and natural Omega-6 and Omega-9 vitamins. Natural scent. 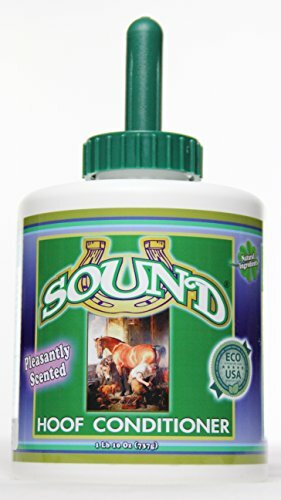 If you have any questions about this product by SOUND Hoof Care, contact us by completing and submitting the form below. If you are looking for a specif part number, please include it with your message.